As the owners of a bicycle shop in the late 1890s, the Wrights could have inspired legions of today’s independent entrepreneurs with just the first phase of their astonishing career, but the Wrights never once settled in their ambitions. Each new success simply ushered in the next challenge. Bicycles led to gliders, fueled by dreams of a motorized, propelled airplane. With a steadfast work ethic and an astonishing knack for observation and mathematics, the Wrights made that dream a reality and together changed the landscape of the industrial world. 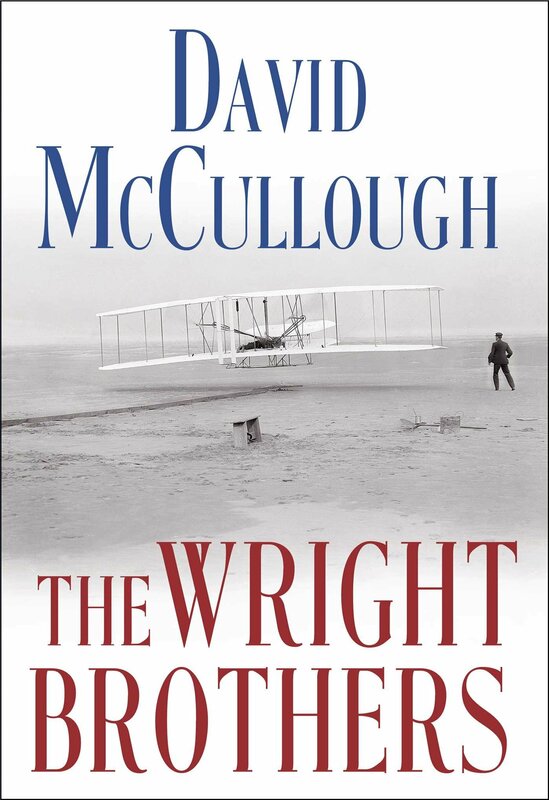 What makes The Wright Brothers such a pleasure to read is that, while historical and painstakingly researched, there is a human family at its core as opposed to simply a timeline of events. Readers are allowed not just to learn, but also to empathize and relate. Wilbur and Orville are a fully realized duo, their differences slight but well-rendered: Wilbur, the eldest, carried himself well and was a better public face of the Wright’s business. He was well-spoken, “never rattled,” and while both wrote cheery letters to their father and sister Katherine, Wilbur took care of most of the writing pertaining to their operations. Orville, four years his junior, “was the more gentle of the two,” a hard-working devoted partner and happy to stay on the ground while his brother tested the gliders. He was known at times for being “wrathy” and prone to “peculiar spells,” but with the exception of a few outbursts was the best colleague one could imagine. 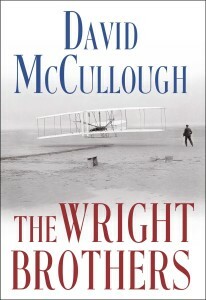 McCullough tracks the Wrights from the industrial turn-of-the-century startup city of Dayton, Ohio to the Outer Banks of North Carolina, where the brothers had their first successful flights with their gliders and motorized airplane. Their success in Kitty Hawk spread by way of the press (in stories often riddled with embellishments) and garnered the brothers government attention, both from the United States and Europe. The last phase of the book sees Wilbur in France with Orville in the States, astonishing the public with lengthy flights around Le Mans (southwest of Paris) and from Governor’s Island in New York around the Statue of Liberty. These vertiginous displays not only wowed locals but connected the United States and Europe in unprecedented spirit. If there’s anything missing in The Wright Brothers it was mysteriously missing in their lives as well. The brothers had no wives and hardly any relationships outside the workshop aside from sister Katherine and their father. Their story is strangely G-Rated, lacking in any sort of mature complications or drama. Perhaps it was an easier time in the 1900s, but McCullough’s book flourishes with an uncut – almost suspicious – purity. McCullough closes the biography before developing any of the airplane’s wartime mutations, but he does so not out of omission but instead of authorial control. This is not a biography of the airplane but a spotlight on its creators, a book about hope and daring to pursue a fantasy, and about a world perched comfortably, unknowingly, on the brink of permanent change. The book swells with greatness within its small, glorious frame. The Wright Brothers will resonate with today’s readers, particularly in their inevitable consideration of contemporary culture’s lack of the support systems that contributed to the Wright’s legacy. While their inherent skill technically made the miracle of flight a success, the Wrights were surrounded by a world dreaming alongside them. There were songs on the radio about flying machines, science fiction films mining the frontiers of imagination. The postmaster of Kitty Hawk on North Carolina’s Outer Banks clamored in letters to have the Wrights set up camp on his beaches, and as McCullough describes it was “the world’s curiosity that had ridden, climbed, waded and trampled all those miles and now lay hiding there, hungry and peering across the intervening sands.” This was a selfless time when people publicly dreamt and wanted to be a part, even a small one, of something great. Today, many of us are fueled not by believing in something but by a fear of missing out on its realized glory. It’s astonishing, even sad at times, to consider our culture’s yaw. I have read the book, it is simply superb and I really appreciate the author for choosing an autobiography of great legends Wright Brothers.